In an hour Miss Jo Jo can transform your home or venue into the prettiest of tea party settings. 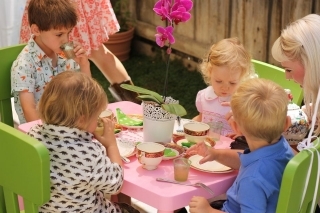 You must provide two separate areas in your home or garden; one for the crafts and one for the tea party. We can use your tables and chairs (a hodge-podge looks fabulous, and adult sizes add to the drama), however we can bring along our fun sized tables and chairs at a minimal cost to you. Please fill out the form at right and click submit. You will receive a call from Miss Jo Jo to plan your party in detail and finalize specifics regarding the menu. Please be aware that we cannot cater for any special dietary requirements of your guests.